This vegetarian barbecue cooking recipe for red peppers and aubergine is packed full of the flavors of the Mediterranean and has to be one of the best BBQ tapas appetizers I’ve ever tasted. I'm calling it Spanish tapas because it makes for a tasty finger food appetizer but it's probably closer in texture and flavor to a Greek eggplant salad. Certainly if you choose to serve the dish lukewarm then this is a typical way of serving food in Greece. Put simply we're going to cook the aubergine (eggplant) and peppers on the grill until soft and then make a paste with chunks of pepper in the mix. This is so simple, just make sure your BBQ’s running hot hot hot! 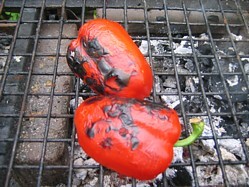 Prick the Aubergines with and fork and place them on the hot grill together with the peppers. Let them all char and blacken for about 30 minutes turning regularly then throw the peppers into a zip seal plastic bag (or use a bowl and cover with stretch film) and leave them to cool. Remove the aubergines from the grill, slice length-ways and scoop out the flesh into a food processor. Add in all the other ingredients except for the fresh coriander and French bread into the food processor and blitz. Transfer to a serving bowl and leave to cool. When the peppers have cooled, take them out of the zip-lock bag and peel the black skin off them (this should come away really easily). Take a few extra minutes to get all the blackened skin off because this will leave a bitter aftertaste. 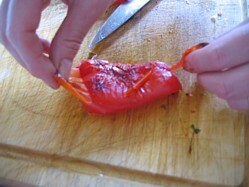 Chop up the flesh of the peppers into a fine dice (discard the stem and seeds) and add to the aubergine paste. Give it a stir to fold in all the red pepper chunks and you're ready to plate up. Slice the French baguette and toast lightly on the grill (you can also rub with peeled halved clove of garlic) and then spoon on some of the aubergine and pepper mix. 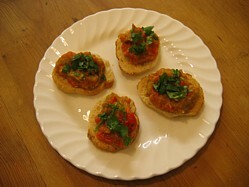 Garnish with the chopped coriander and there you have it - great tapas. Eat one quickly before they get gobbled up!